THERE was something surreal about looking out the window of our holiday cottage and seeing palm trees and snow. But then this was springtime in Scotland - we should have learned to expect the unexpected. Two years ago at Arisaig, we were slapping on the sunscreen during an April heat wave. Fast forward 12 months and we were battling blizzards and freezing temperatures from our base in Ballater. Now here we were in picturesque Plockton, the forecast of a repeat performance from northerly winds hanging over the trip. Day One provided the first surprise. The bad weather had been held up somewhere on its journey south and we drove over the pass into Glenelg and on to the end of the road at Arnisdale accompanied by sunshine framing extensive views. 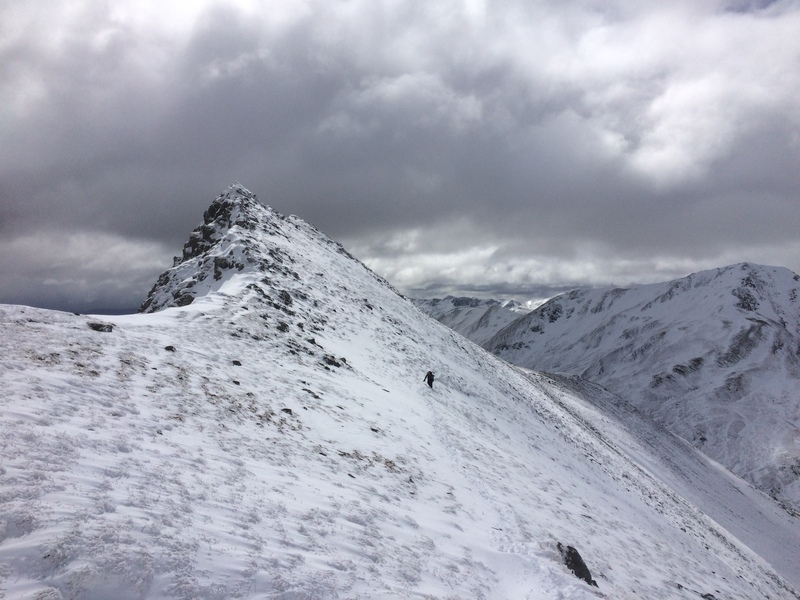 A traverse of Beinn Sgritheall was managed at a leisurely pace, and the feeling of having struck it lucky saw plenty of sitting around letting the beauty of the landscape sink in. Ladhar Bheinn had a cap of snow, as did the Glen Shiel heights, and Skye, Rum, Eigg etc stretched out on the horizon, their familiar shapes welcoming us for the week. There’s always a feeling of satisfaction when the first day is a success. Whatever happened from now on seemed inconsequential. Day Two arrived amid a forest of aching knees - the unrelenting steepness of Beinn Sgritheall often has that effect - and heavy sleet driving down from grey skies. I decided on a short day by taking the historic Achintee Path to reach the Graham, Creag Dhubh Mhor, and was rewarded with a spectacular cloud clearance at the summit. Day Three saw four of us headed down Glen Shiel to tackle the Munro, Ciste Dhubh, the overnight snow lying down to the road. It was soft, but deep, and the higher we rose, the deeper it got. The narrow ridge spiralling up to the small summit had to be tackled with care, parts of the path obliterated by deep drifts, the line between solid ground and cornices often blurred. Day Five was the wildest yet, a constant sheet of white falling in Italic style, obscuring visibility and piling up underfoot. Always the optimist, I set off with one other hardy soul for Maol Chean-dearg. We were just a few miles east, but here the moisture was lighter, the air warmer. It was only when we reached the col before the final climb that winter bit back. It was a tough push to the summit against blasting winds, the deep snow making every step a lottery, no chance to work up an even pace. We sat at the cairn for a few minutes to catch our breath and then set off. Within seconds we realised our inward track of footsteps had already been filled in, so we went back to the cairn, took a reading and set off again into the sea of white. Day Six brought sunshine and clearer skies. Some had a quieter day, an easy ascent of Biod an Fhithich in the shadow of The Saddle, but while we were enjoying the expansive view down Loch Duich, others were encountering problems higher up. 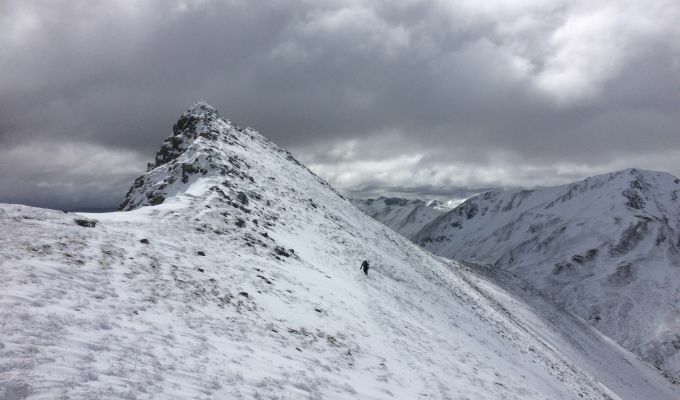 They had crossed A’Chralaig without any problem but were forced to retreat from the pinnacled ridge leading to Mullach Fraoch-choire with the path buried under feet of snow and no obvious, safe alternative. It was a stark reminder of winter’s continuing hold on the hills. 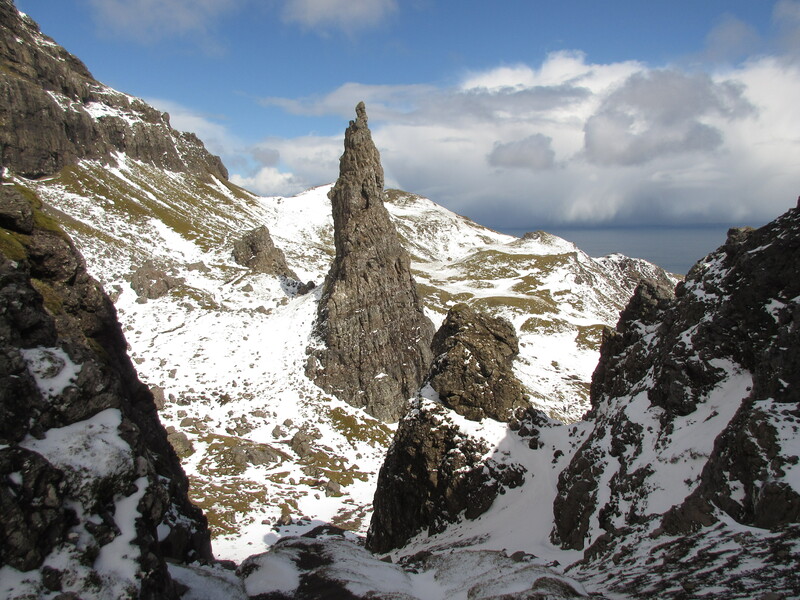 Day Seven - for the finale it was off to Skye again, but following yesterday’s cautionary tale we decided to give the Black Cuillin a body swerve, instead heading for Bla Bheinn. We arrived in a downpour, dark rock faces streaked with white warpaint looming menacingly overhead. We met a couple on their way down, spooked by the threatening weather. We were soon in the snowline, but stuck to our task and bearing and, after one short scramble through a series of crags, emerged at the trig point summit. There was only a fleeting glimpse of the Black Cuillin, but we were satisfied with our lot. Seven days of winter, seven days of walking.